The Pepperpot, so called because of its shape is located at the junction of the High Street and Church Street in Godalming. 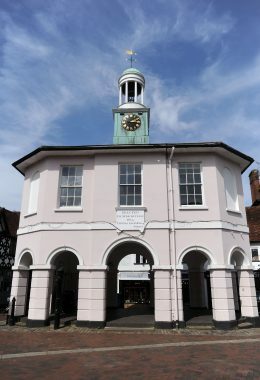 This iconic symbol of Godalming was formerly the Old Town Hall but is now available for hire. The upper parts of the building house a meeting room along with a kitchenette and WC Facilities. The lower part (undercroft) is available as a small market place. On Tuesdays and Saturdays you will find one of Godalming’s greengrocers located in the undercroft. Godalming Town Council has a designated Safeguarding Officer.